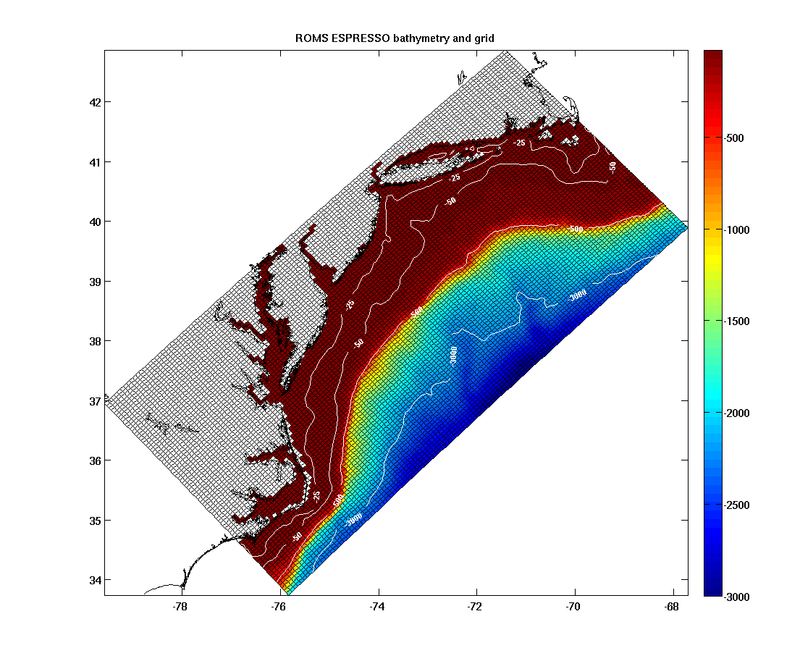 The Regional Ocean Modeling System (ROMS) ESPreSSO (Experimental System for Predicting Shelf and Slope Optics) model covers the Mid-Atlantic Bight from the center of Cape Cod southward to Cape Hatters, from the coast to beyond the shelf break and shelf/slope front. The prototype system is a 5-km horizontal, 36-level ROMS model with Incremental Strong Constraint 4DVAR assimilation of AVHRR and daily composite SST (remss) and along track altimeter SSH anomalies (RADS). Initial conditions were MOCHA Mid-Atlantic Bight climatology dynamically adjusted by ROMS IS4DVAR. Meteorological forcing is NCEP/NAM 12-km 3-hourly forecast data. Boundary conditions are from HYCOM NCODA forecast system. Hudson River discharge is from daily average observations. Tide boundary conditions are from the ADCIRC tidal model. We compute forecasts starting from the initial conditions which are obtained by minimimizing the model-data misfit over previous 3-day window. 3-day forecasts are recomputed daily based on the new observations obtained in real-time. Open boundary conditions are simple gradient conditions because the Orlanksi-type radiation conditions typically preferred in this type of application are not well-posed in the adjoint model formulation. Air-sea heat and momentum fluxes are calculated by the bulk formulae of Fairall et al. (1996,2002) using the model sea surface temperature and sea level air temperature, pressure, relative humidity, and 10-meter winds. 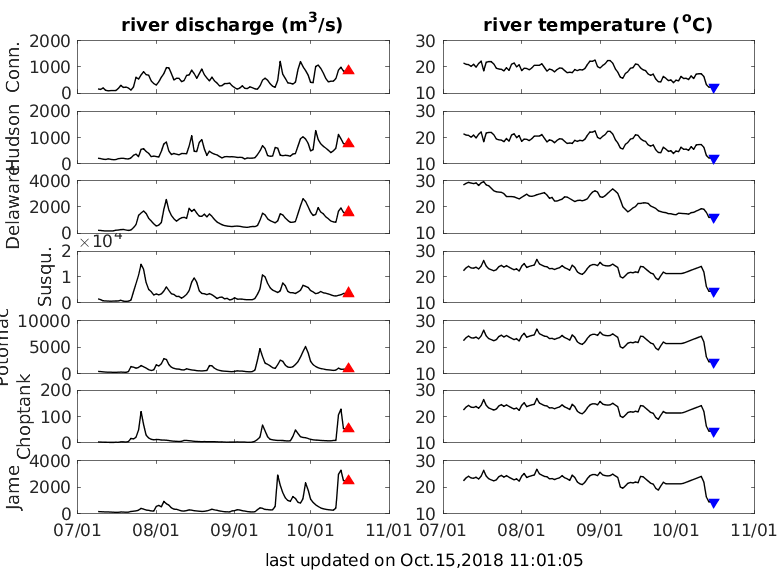 The inflow of the Hudson River is specified using a simple estimate computed as 2 times the sum of the daily mean observations at the Mohawk and Fort Edward USGS gauges. The Delaware River is included with a monthly climatological flow rate and the model solution for the Delaware should not be trusted. Atmospheric forcing data are taken from the North American Mesoscale (NAM) forecast system operated by NCEP. NAM is an implementation of WRF-NMM for the North American continent and adjacent seas, with a horizontal resolution of approximately 15 km. Documentation of the WRF-NMM (Weather Research and Forecasting - Nonhydrostatic Mesoscale Model) is available here. ROMS uses NAM surface air temperature, pressure and relative humidity, 10-m vector winds, rain, downward longwave radiation, and net shortwave radiation, to specify surface fluxes of momentum and buoyancy using standard bulk formulae. For ROMS hindcast and data assimilation cycles, the NAM data used are 3-hour interval forecast data starting from 0600 UTC in the forecast cycle launched at 0000 UTC each day. The first two 3-hour interval fields (0000 UTC the meteorological "analysis", and 0300 UTC) are not used because diagnostic quantities (clouds and precipitation) appear to be adjusting in this interval. The complete 72-hour forecast that commenced at 0000 UTC each day is kept available in an archive updated daily for operational ocean forecasting initialized with the latest ROMS 4DVAR analysis. Boundary conditions are obtained from HYCOM-NCODA real-time forecast, a description of which is given here. HYCOM 5-day forecast is computed daily, based on a 5 day reanalysis of SST, SSH and all available in-situ data from XBTs, ARGO floats and moored buoys. In order to remove bias, the last year HYCOM mean of temperature and salinity is replaced by the new MOCHA climatology, developed at Rutgers for Middle Atlantic Bight. Velocity and free surface heights are corrected by replacing the HYCOM mean with the results of assimilative ROMS climatological run. Cahill, B., O. Schofield, R. Chant, J. Wilkin, E. Hunter, S. Glenn, and P. Bissett (2008), Dynamics of turbid buoyant plumes and the feedbacks on near-shore biogeochemistry and physics, Geophysical Research Letters, 35, L10605, doi:10.1029/2008GL033595. Haidvogel, D. B., H. Arango, W. P. Budgell, B. D. Cornuelle, E. Curchitser, E. Di Lorenzo, K. Fennel, W. R. Geyer, A. J. Hermann, L. Lanerolle, J. Levin, J. C. McWilliams, A. J. Miller, A. M. Moore,T. M. Powell, A. F. Shchepetkin, C. R. Sherwood, R. P. Signell, J. C. Warner and J. Wilkin, (2008), Ocean forecasting in terrain-following coordinates: Formulation and skill assessment of the Regional Ocean Modeling System, Journal of Computational Physics, 227, 3595-3624. Hofmann, E. E., J.-N. Druon, K. Fennel, M. Friedrichs, D. Haidvogel, C. Lee, A. Mannino, C. McClain, R. Najjar, J. Siewert, J. O'Reilly, D. Pollard, M. Previdi, S. Seitzinger, S. Signorini, J. Wilkin, (2008), Eastern U.S. Continental Shelf Carbon Budget: Integrating Models, Data Assimilation, and Analysis, Oceanography, 21, 86-104.